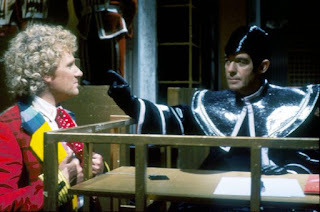 Michael Jayston, at 80 has lost none of the powerful presence and commanding voice he brought to the screen as The Valeyard in The Trial of a Time Lord. The main difference here is that in person, the gentle manners and good nature of the man himself are as far away from The Valeyard as you could imagine. After very graciously agreeing to a few short words for the record, in honour of our 30th Anniversary Feature, we sit down, he smiles and we both take a moment to reflect. What was your level of awareness of ‘Doctor Who’ before you worked on ‘The Trial of a Time Lord’? 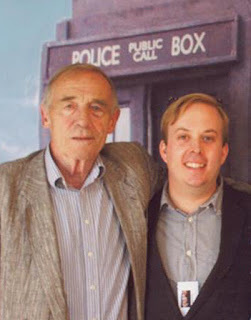 I was aware of Doctor Who when I got the call for ‘Trial’ – it was legendary even then. I’d watched quite a few of Tom Baker’s - we’d worked together ‘Nicholas and Alexandra’ (1971). I can’t say that it was a brilliant film career-wise - It didn’t really take off, and early on, the director had taken me to one side and asked me to ‘tone down my voice a bit’, which was odd. With Doctor Who though, it was no question I’d do it. I never thought at the time I’d still be discussing it 30 years on! What had you been up to professionally in the few years before Doctor Who? I’d just been in ‘The Way of the World’ with Maggie Smith for a year, so quite busy, I enjoy theatre work - I’d been in Rep for a couple of years, and done ‘Equus’ and ‘The Sound of Music’ too. What was it like working on Doctor Who? My part was very studio bound –we filmed over several weeks. It could be difficult as we were often reacting to scenes that were still filming elsewhere. Did this hinder you as an actor? Not particularly – it’s acting, but also, as ‘the bad guy’, you can pretty much say anything as long as it’s done with conviction. It was nice once we got out onto location at Camber Sands for the location filming at the end. Were you aware of any of the difficulties for the production at the time? Of course, yes, but I didn’t feel in a position to say something really. Colin might have had a little more grounds to do so, but he also kept his cool. John Nathan Turner was a lovely man, but had his share of arguments. He was under pressure. Poor Robert Holmes was ill and some of the other scripts were a little ‘difficult’. One has to work a little harder in those situations to make something out of it. In retrospect, it’s clear the programme was not far from cancellation. Yes – it could have ended there and then really. Did you enjoy playing The Valeyard? Yes of course. He’s the Evil Side of the Doctor, and really is another of the Doctors. I felt they could have made more of it at the time, or done something with it later. John Hurt has been brought in as another doctor, and they’ve mentioned the Valeyard recently, but where is he? I often find at signings that fans have complete collections of ‘Doctor’ Autographs, and at the end there’s The Valeyard with a question mark, so I always sign it. Except perhaps for the costume? What did you think of the hat? I didn’t like the hat at all – it came down between the eyes, and had a tendency to curl up. They were always having to stick it back down between shots. I was relieved to be rid of it when we went on location. What was it like working with Lynda Bellingham? Lynda was lovely, and I admired her work, as she admired mine. I think she was having a tough time at that point, but she was always lovely. You’re obviously proud of being a part of Doctor Who and have attended conventions down the years, likely facing a lot of similar questions. Are there projects that you’ve worked on that sometime you think ‘I wish someone would ask about…’? Well, I played a lot of interesting people. I was Siegfried Sassoon in ‘Mad Jack’ (1970), and played Beethoven (1970) and Rochester in Jane Eyre (1973) amongst others. When I did Equus in 1976, a critic described my work on television as ‘odd bits of TV’, but these are no small parts for an actor. ‘Mad Jack’ had a screening at the BFI a couple of months back as part of a James Gold retrospective, which was lovely. My turn as Rochester in ‘Jayne Eyre’ also has a cult following in the states. There is one lovely fan who has even compiled a site dedicated to my work and is very supportive and lovely – Charlene from California. And with that, he was gone, back into the fray, and ready for his panel.